Innovative Research Delivering leading-edge medical treatments and technologies to patients. World-class Care Providing innovative leadership in research, teaching and patient care. Teaching Excellence Transforming academic medicine as one of University of Toronto's affiliated teaching hospitals. 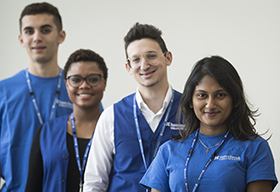 The Department of Medicine is Sunnybrook's largest department with 99 full-time and over 200 part-time faculty members. 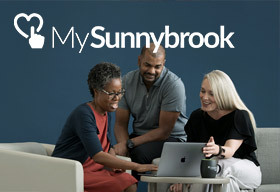 We have 15 divisions and work in an interdisciplinary environment with Sunnybrook's care programs and other departments. 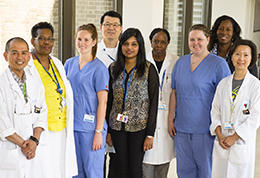 Our leadership in clinical practice, education and research ensures optimal care for every patient. Click to see Sunnybrook's Department of Medicine at a Glance infographic. Click here for a text only version. 15 divisions. 5 inpatient services. 176 acute beds. 5.6 day average length of stay. Hand hygiene performance has increased substantially as measured by our electronic monitoring initiative (44% to 60%) associated with a 30% reduction in nosocomial transmision of MRSA. Through the implementation of standarized order sets the rate of hypoglycemia in admitted patients has declined from >20% in 2010 to around 10% in 2013 and <5% in 2016. Our readmission rate for Congestive Heart Failure has dropped by 30% from 20% to 14% as of June 2018. Along with this, our median LOS for Heart Failure has decreased to below the national and provincial benchmarks. When a patient is treated through one of Sunnybrook's 8 care programs, they are cared for by doctors from one of the Department of Medicine's 15 divisions. Our doctors, researchers and students integrate clinical practice, education and research. They deliver safe, leading edge care and treatment options to our patients. 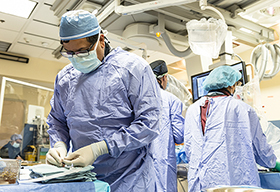 As one of the University of Toronto's affiliated teaching hospitals, we provide an innovative learning environment, promoting critical inquiry and exchange between clinicans, researchers and educators, as featured through our Grand Rounds. We are training the next generation of doctors and researchers to deliver the best possible health outcomes for local and global populations. Research is a vital component of our care model, bringing leading edge discoveries from the lab bench to the bedside. Our researchers are at the forefront of their fields, working towards new advances in the understanding and prevention of disease, improving the quality of care to those we cannot cure, and developing innovative treatments that improve and extend life.